Start by mashing two very ripe bananas. 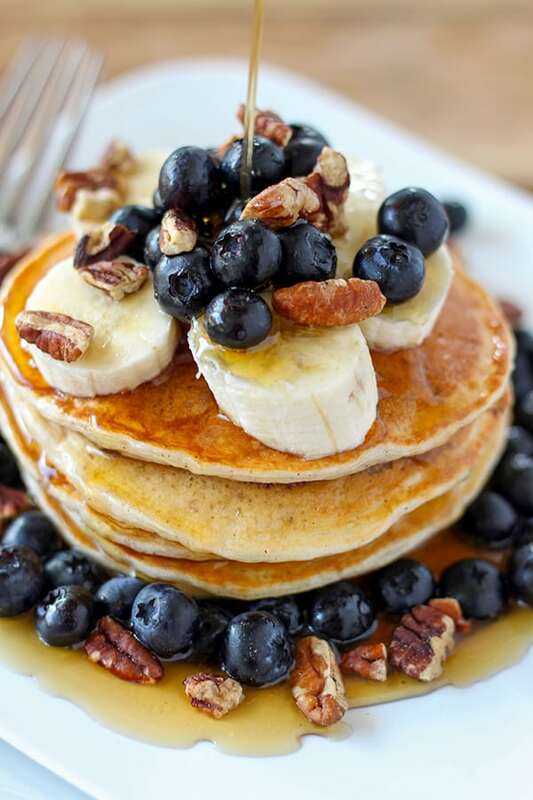 These give the pancakes a touch of sweetness without the added sugar. Then stir in fat-free plain greek yogurt, egg whites, skim milk and pure vanilla extract. 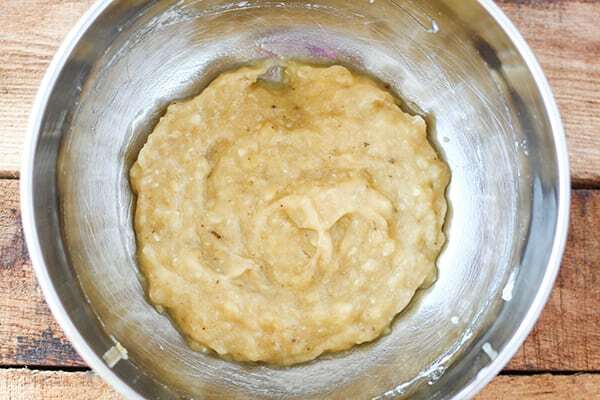 In a separate bowl, whisk together dry ingredients then add wet ingredients to dry and stir just until combined. 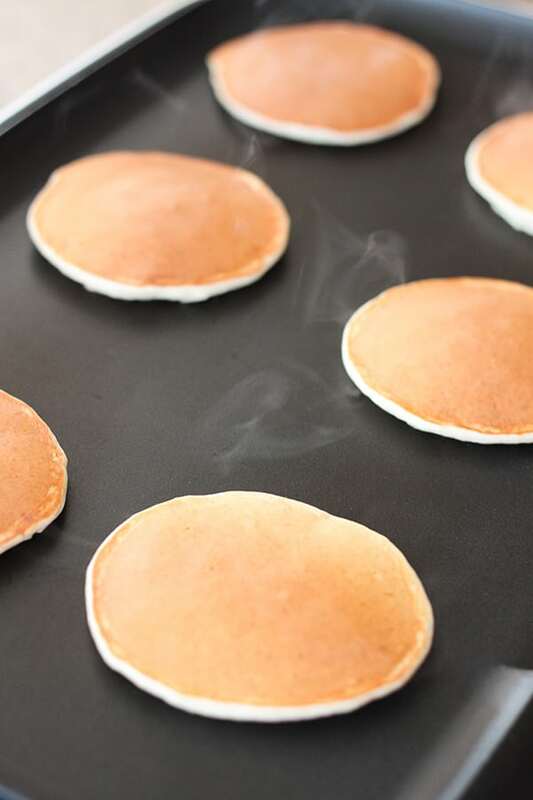 Measure pancakes by the level 1/4 cup full onto non stick griddle. 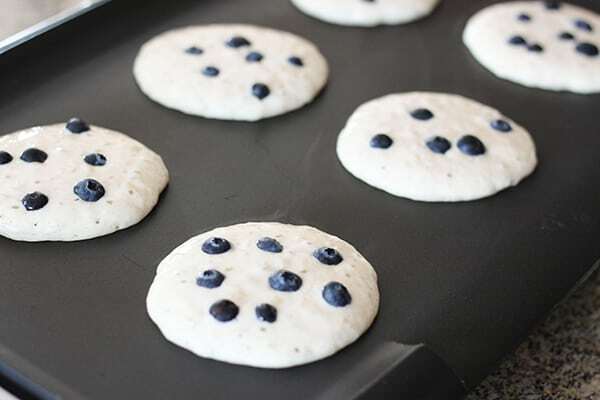 You can also add fresh blueberries! 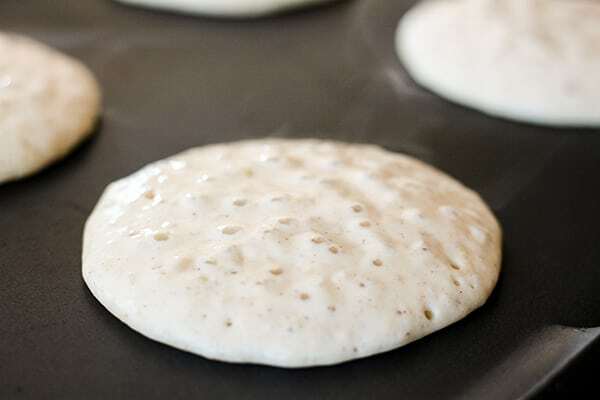 Just drop them onto the pancake batter once the batter is on the griddle. Perfectly golden brown and delicious! Nutrition Information is from the Weight Watcher Recipe Builder and My Fitness Pal Nutrition Calculator. I made the serving size one pancake so it’s easier to track points. 3 pancakes are 3 Weight Watcher Smart Points, 4 pancakes are 4 Weight Watcher Smart Points, etc. For me, the perfect serving size is three pancakes. Then I can add fresh fruit, a sprinkle of chopped pecans and a drizzle of pure maple syrup. I really love this pancake recipe because I can add my favorite toppings and keep it point friendly. I usually serve them with a sunny-side up egg or a serving of turkey sausage on the side. I adapted this recipe from a Greek Yogurt Pancake recipe I shared back when I first started blogging. The post is old and the pictures need to be updated, but it’s a great recipe too! I replaced the sugar and butter in the recipe with bananas to make it more Weight Watcher Smart Point friendly and I don’t think you will miss it at all! Girl – you just gave me everything I needed! YUM! I love that they are just 1 point!!!!! Makes for a happy breakfast! And now I’m going to need to insist that you share about your progress (or just to me). I’m thinking of starting and WW is so new (different from in 2001 when I lost 22 pounds) I don’t really know where to start. I think that arming myself with recipes and strategies would be the key to my success…share, share, share!! I’m desperate…can’t wait to try these! I haven’t tried, but I don’t see why that wouldn’t work just fine. I topped these with blackberries and raspberries and they were TO DIE FOR!!! OMG Best pancakes I have ever eaten! Thank you for sharing! I just started the WW Freestyle program 3 weeks ago and I am really liking the new plan. 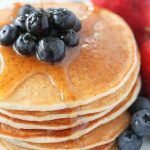 I have been craving pancakes and these were fantastic, they really did the trick. My husband also gave them two thumbs up, they will make it into a normal rotation for us. Thanks! These were great for Pancake Day today 🙂 and no post dinner guilt! can you substitute the all purpose baking flour for gluten free baking flour? I haven’t tried that, but if I do, I’ll update the post and let you know! Thanks for the question! I am new to WW and am confused. According to the WW app on my phone, 1/4 cup of flour is 3 points. Your one-point pancakes takes 1 cup of flour. If I make 4 pancakes, wouldn’t the points be 3 points per pancake? Hi Cindy! The recipe makes a total of 14 pancakes. Hope that helps! Thank you Melissa. Yes that makes sense now. When no one is looking, I may sprinkle a couple mini chocolate chips onto each one. . . . I could not find your skinny one point pancakes on the WW website so I added the recipe in myself. In the notes section I wrote that the recipe did not belong to me and I retrieved it from https://www.number-2-pencil.com/skinny-one-point-pancakes/. So is it ONE point PER pancake?? About how round are your pancaks? I measure the batter using a 1/4 measuring cup. These are delicious. I used one banana (instead of two) and added 1/8 tsp nutmeg. I left the mashed banana a little chunky and added an extra 2 Tbs of the nonfat milk. Ate 3 served up with ripe strawberries. I am full, my brain and my mouth are more than happy, and its 3 points. So far I am not experiencing the “pancake lag and sleepiness” I usually get after 3 pancakes. I love that the point count is so low because it does leave room for syrup when I want it. Winner!! Thank you. That sounds great! Thanks for sharing! Melissa, I never left a comment before, but wanted to thank you for this recipe. 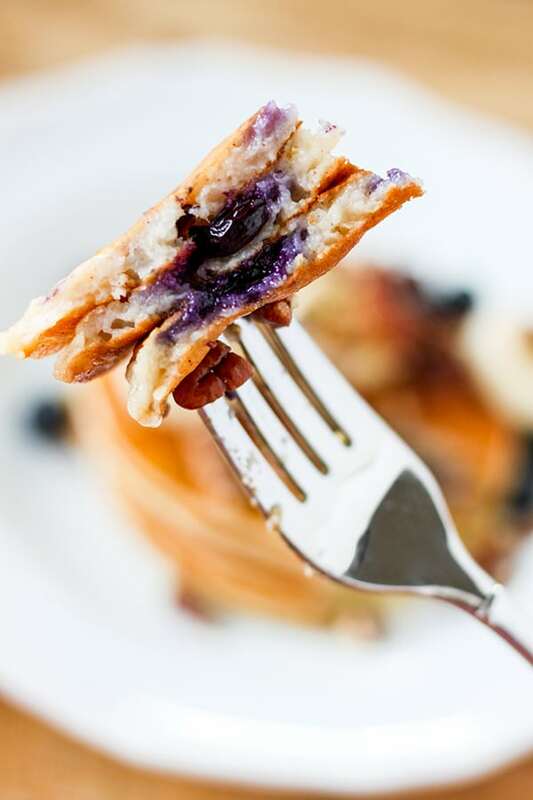 My husband and I LOVE pancakes but I dread to make them because they normally are so fattening. Also I only have 20 points a day and try to use as little as possible early I in the day. My pancakes were just a bit gooey so I may add just a bit more flour or a little bit less banana next time. 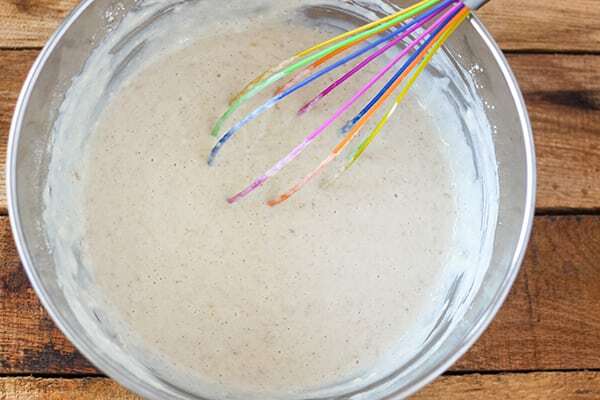 Just to clarify why people were confused about points was you mentioned making each pancake 1/4 of batter in your recipe, but I am pretty sure you meant 1/4 CUP of the batter. Will definitely be making these again. My fussy husband thought they were good also. Thanks again! Thank you so much Toni! I appreciate you taking the time to leave a comment. ❤️ I’m so glad you both liked the recipe! Sorry Leona, I’m not sure there is a good substitute. Possibly fat free sour cream, but that could create a totally different texture. These look fabulous and I’m looking forward to giving them a try! What do you think about putting in some pumpkin purée? I had been craving pancakes since starting ww and these were perfect! Added the blueberries and I really liked the flavor! Thanks for the great recipe.